Lighten up those dark manufacturing areas with an ErgoDeck® Illuminate System. ErgoDeck® illuminate tiles offer a convenient way to lighten up poorly lit work areas from the floor up. 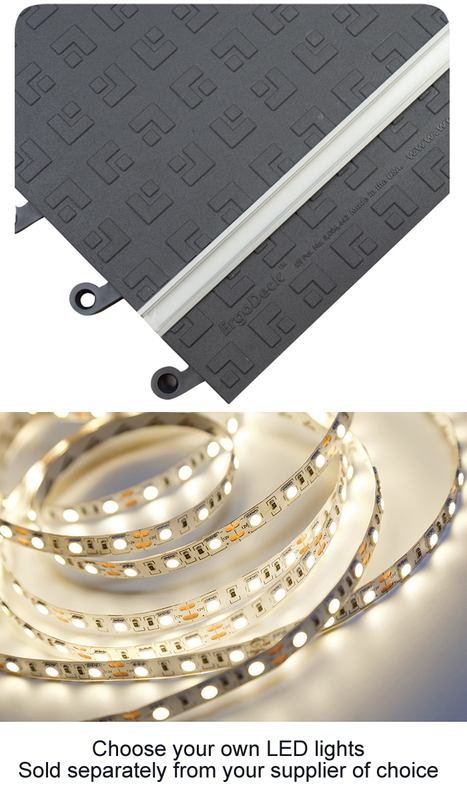 Each tile can accommodate up to five Illuminate channels. The system is extremely simple, flexible and cost effective! We provide the customized ErgoDeck tiles, the aluminum channel and the protective clear or frosted lens for the channel. You get to choose the LED lighting (sold separately) from the huge array of options available in the marketplace. I want to talk to someone about adding the Illuminate System.